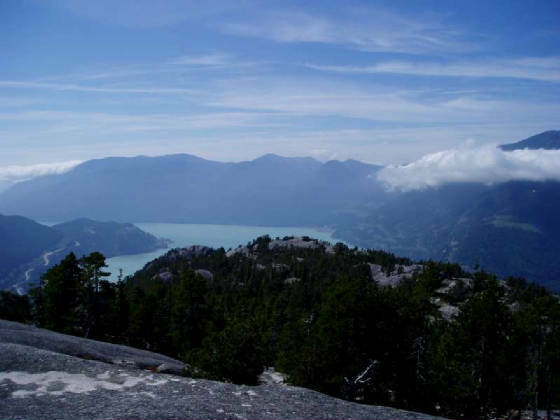 Not having access to a 4x4 and just coming off of a serious 3 week flu the viable climbing options in Vancouver were looking a bit slim so I decided to once again climb (errr hike...) the Stawamus Chief near Squamish B.C. 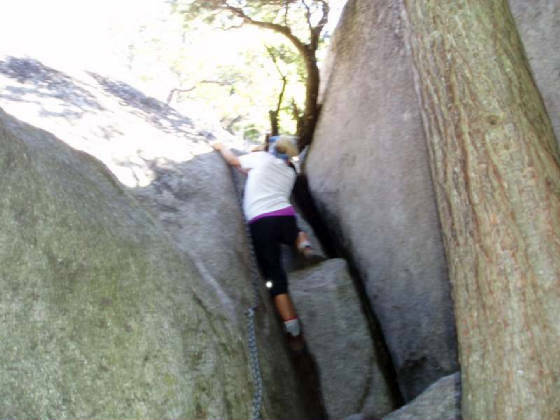 The Chief is an extremely serious rock climbing destination, a Mecca of sorts, often called Yosemite North the Chief is a huge granite monolith second only in size to the rock of Gibraltar. 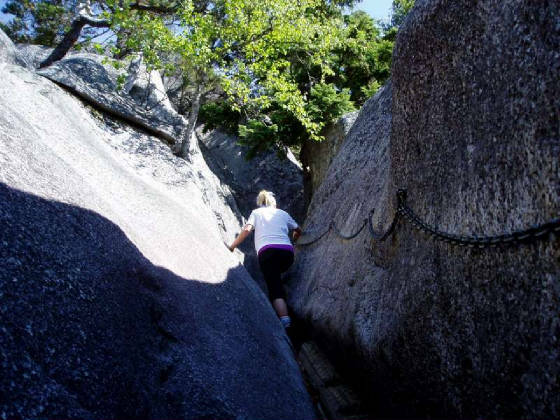 The back side of the Chief, likely originally a climbers descent route (like Yamnuska) offers a relatively easy ascent. There are three peaks to the Chief, the first and lowest peak is often the most crowded and is avoided by “those in the know”. 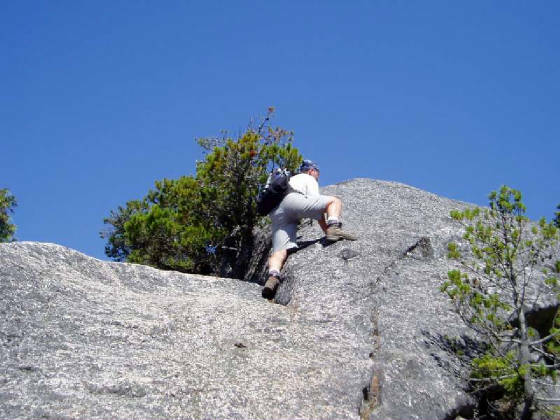 The best route is to climb the 2nd and 3rd peaks probably by going up the gulley to the 3rd peak first then traversing over to the 2nd and then back down via the iron ladders and chains to the gulley between the 1st and 2nd peaks. 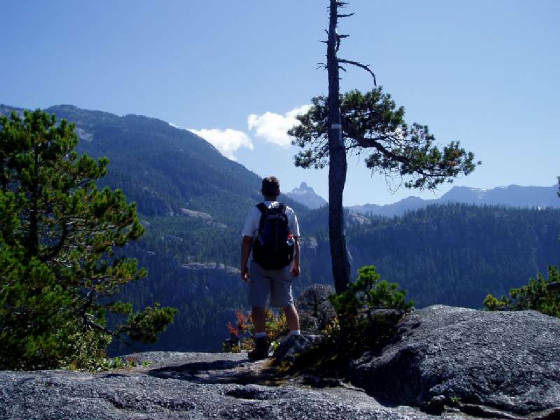 I should warn you that this little trip has become a very popular outing and there will be dozens of people on the trails to the 1st and 2nd peaks. The 3rd peak is still relatively less traveled as evidenced by the huge difference in the quality of trail between the 1st and 2nd gullies. When I first did this climb close to 15 years ago there were still some route finding problems although there was, even then, Via Ferrata on the 2nd peak. 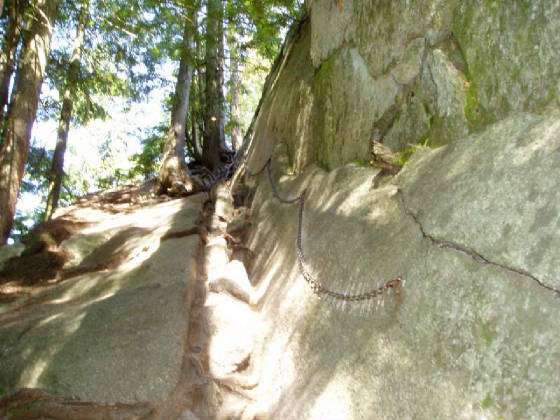 Now days it is literally a staircase like the Grouse Grind on the lower mountain. If it were not for these aids this trail would be moderate to difficult scramble complete with some short 5th class sections, with the aids it ranks as perhaps easy 3rd class but never exposed on any of the climbing sections. 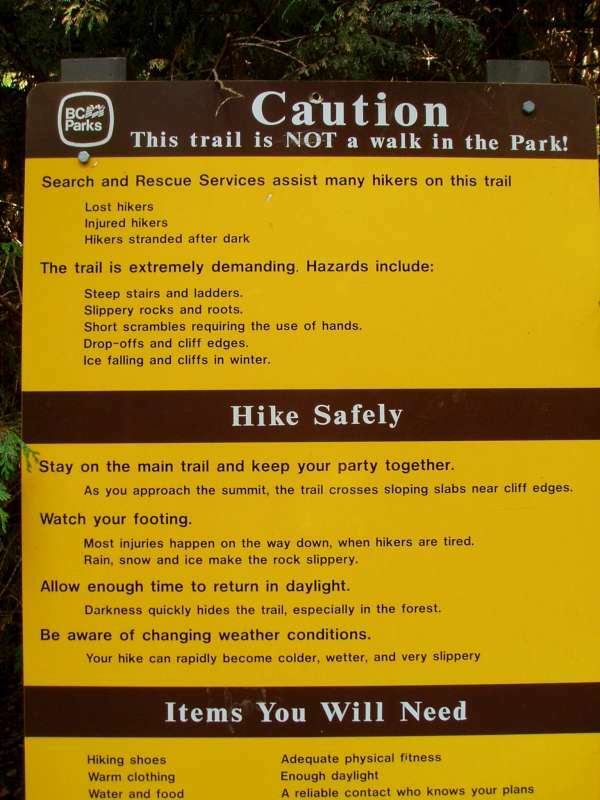 I get a kick out of these signs, they make it seem like you are about to climb K2. I guess when enough tourists get killed one of these signs need to go up. The trail as it nears the top and scales the wall to the right. 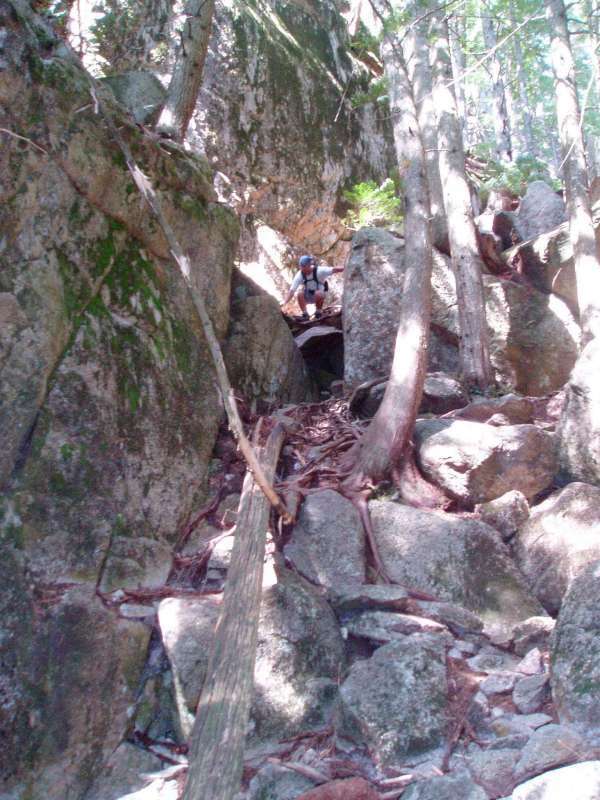 The trail in a granite gulley. Blurry action shot! Assisted scrambling as the gulley continues. 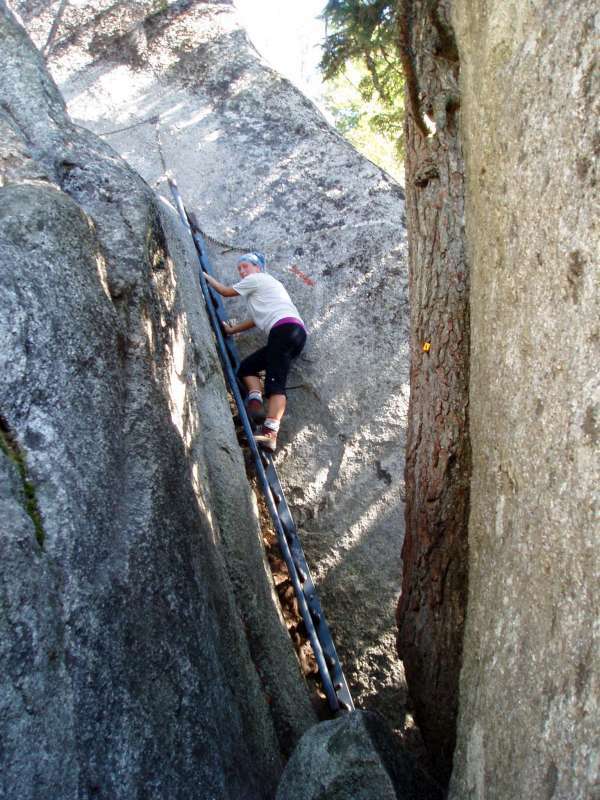 Massive 2000 foot drops are within spitting distance as I take the hard way up... of course (dork). Almost at the 2nd Peak, looking back at the crowded nub of the 1st Peak. At the 3rd Peak looking South-West at the ocean. Near the 3rd Peak looking South at what I think must be one of the Lions. The West Lion is a scramble that has claimed many lives. There are also now some fixed ropes in place on the Lion. 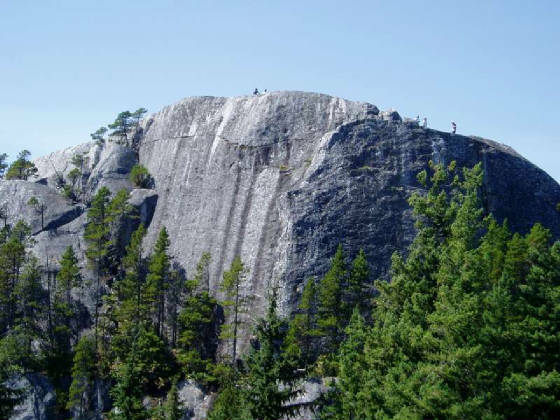 (In Vancouver people don’t generally use the term “scramble” it is either a “hike” or when it gets 4th class and exposed it is a “climb”). Scrambling down some easy/moderate terrain in the broad gulley between the 2nd and 3rd Peaks.